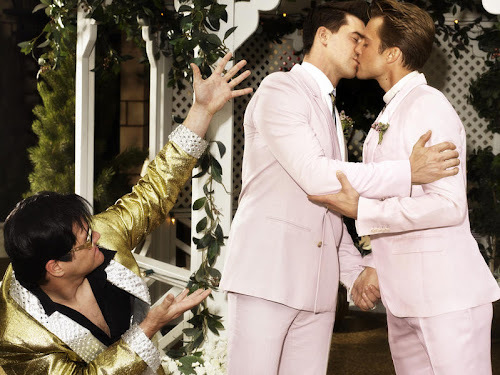 The August 2010 issue of Out magazine features the romantic Viva Las Vegas with models Jason Morgan and Mark Ricketson, photographed by Matthias Vriens-McGrath and styled by Grant Woolhead. this is how I Want spend all my life with my boyfriend... excellent Pics.!!! I've wondered since then if they are a couple in real life. That's the weeding that I wanttttttttttttttttttttttttttt!! this is one of the greatest posts! I have loved these photos since I first saw them in the August 2010 issue of Out. The photography in itself is fine art. In the photos there are romance, sexiness, humor, stylish clothes and of course two handsome guys.